by Deborah Shelton Wood, for Fred Behr, in honor of this ancestors. Mr. James Hook and Ms. Charlotte Morris were united in marriage in Greene County, Pennsylvania circa 1800. Their daughter Charlotte Hook married William Baxter. They were the great-grandparents of Marguerite Baxter who became Mrs. Otho Moring Behr I. The Hook and Morris familes were from Maryland and New Jersey, respectively. John and Sarah Hook gave birth to James Hook, circa 1750 in Frederick County, Maryland. Captain James Hook married Mary Lieth, daughter of Robert Lieth/Lyeth and Sarah Lakin also of Maryland. Captain James and Mary Hook's son, James was born about 1775 in Greene County, PA. His brother, Israel Hook is found at age 77 living in the home of his niece, James' daughter, Charolotte Hook Baxter in the 1860 census of Allegheny County, Pennsylvania. Charlotte Morris (Mrs. Jame Hook), comes from an ancestral line that includes Lewis Morris, commonly known as Lewis of Passage Point. This is to distinguish him from his cousin, Lewis Morris,who became governor of New Jersey in 1738. Lewis "of Passage Point" Morris was a Court Justice in Monmouth County, NJ. He and his wife, Elizabeth Almy of Rhode Island made New Jersey their home. Passage Point is known today as Black Point, NJ. They lived at "Rumson House", an estate built by early settlers between the years of 1710 and 1711. Among those who once lived at Rumson House was the former President Abraham Lincoln. The Morris family was originally from Monmouth, Wales. 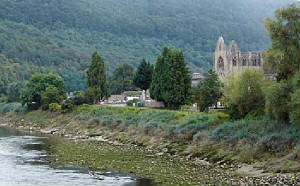 They lived in the village of Tintern near the Wye River. Wales is also the place of origin of the Hook family. To see more on the ancestry of these families please visit the family tree at the link below. Newspaper, "The Hub: published in Red Bank, NJ. September 22, 2005.